An annual post. Navel gazing at my fake baseball team. Feel free to skip if you’re not into this. Welcome to Fantasy Baseball 2019. We have again cobbled together 10 baseball fans to keep our fantasy league running. We’ve been going since 2006. I’ve never quite managed to win this league; a couple of 2nd places, a couple of regular season championships and upset playoff losses. I’ll bury the lede here; i’m not sure my 2019 team is very good. Well, maybe its ok. I got the 7th pick (I have NEVER gotten the #1 pick, not once in the 14 years we’ve been doing this; I’ve never had Trout or Pujols or whoever was the consensus #1 player. Never). Grrr. This year, no autodrafts, and we used Yahoo online drafting which only gave 2 minutes per pick, so we cruised through. Which is nice. Here’s my general Fantasy strategy: focus on hitters before pitchers, try to get key positions of scarcity in the infield first (2nd, SS, 3B). Do not spend a high pick on a 1B. If you don’t get one of top 3-4 catchers, don’t bother until round 21 (or at all). Get a slew of top closers, target getting 5 in all. Don’t burn early round on SPs unless forced to by situation. Here’s how the draft first 6 picks before me went. Picks 1-6: Trout, Betts, Ramirez, Scherzer, Acuna, Arenado. So, heading in I wanted Jose Ramirez; he was ranked Yahoo #8, but is ADP #3 and was much higher on other rankings … so I guess it isn’t a surprise he went so high. Acuna was a slight reach but was drafted by our Atlanta-fan boy member. Round 1:/#7 overall: J.D. Martinez (#4 Yahoo, #4 2018 stats, #5 ADP): I was considering Trea Turner here, since he was also projected around this area … but something made me pause on Turner. Could have also gotten Yelich, or Chris Sale, but in the end I like the power Martinez had, and the fact that I was getting slight value in terms of Yahoo rank and ADP already in round 1. Round 2:/#14 overall: Alex Bregman (14/8/13): So, I really wanted one of two players to slip to me here: Soto or Harper. Missed on both; they went bang bang right in front of me (this became a theme on the night; losing players I was targeting just before they got to me). So i was choosing between Bregman, Story and Altuve. I chose Bregman basically for positional flexibility; he can do SS or 3B, which is huge. And, Bregman is a beast. 30 homers and 100 RBIs from the SS position?? Its one of the best kept secrets in the game… and I’m not quite sure why he’s projecting as a 2nd rounder given he was top 10 in production last year. I think this is a steal here and I love the pick. Round 3/#27 overall: Francisco Lindor (20/10/12): At this point in the draft I wasn’t looking for anyone in particular, but Lindor was sitting there as a huge outlier. #12 ADP, meaning an early 2nd rounder, and a top 10 fantasy producer last year … still sitting there? SS eligible too? 38 homers, 25 steals last year. Why was he still here? Grabbed him; now I have two SSs, a 3B and an OF. And they’re all massive producers offensively. Round 4/#34 overall: Vladimir Guerrero Jr (41/na/50: ok so one of my goals was to get this guy. I’m banking on him being a monster. 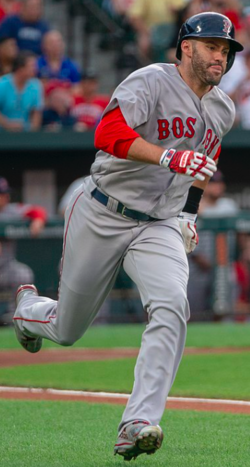 Yes he’ll miss some time, and yes maybe he’s “injured” right now, and yes this was a reach (i could have had Benintendi or Whit Merrifield instead). But its been a while since I had the super stud rookie to root for, and I’m banking on him crushing. So I got #50 ADP at #34 … but also played the room and since my next pick wouldn’t be until deep into the 5th round he wouldn’t have lasted. Round 5/#47 overall: Lorenzo Cain (46/89/63): I wasn’t really enamored of this pick; was trying to decide between him and first SP in Carrasco. I dunno; maybe this was a mistake. Lots of steals, big time OBP. Round 6/#54 overall: Blake Treinen (73/15/66): So, there was a slight run on closers here so I grabbed one. Treinen was #15 fantasy player last year. He was frigging amazing. Can he repeat it? Hopefully; blowing a 6th rounder on a closer isn’t out of the norm, but I like my chances here. Round 7/#67 overall: Zack Greinke (53/121/58): Round 7 and I still didn’t have a starter … needed to start getting some pitching. Got what I think is good value on Greinke after getting Corbin snaked right before my pick. Corbin was a steal in round 7 … so hopefully Greinke rebounds a little bit. I’ll take ADP of 58 at 67 though. Round 8/#74 overall: Daniel Murphy (50/873/71): So, Murphy was sitting there, clearly the BPA and highest ranked player still available on Yahoo (projecting as end of 5th round), so what the heck. He’s in Colorado, we know he can hit, he fits 1B or 2B … so i’ll take Murphy as my 2B. Round 9/#87 overall: Felipe Vazquez (90/59/98): Another mini-run on closers led me to grab VAzquez here. I wanted Puig here and just missed (a common theme on the night). Ironically i now have two closers and both are ex-Nats. Vazquez’s production last year was 2-3 rounds better than his draft position, so I’m hoping for him to repeat his 2018 performance. Round 10/#94 overall: Mitch Haniger (77/37/83): So, how is a guy who was 37th ranked producer still sitting around in the 10th round? I don’t know, but he was sitting there as a massive outlier, easily BPA by like two full rounds of players, so I grabbed him. ESPN calls him a huge sleeper; we’ll see. Round 12/#114 overall: Charlie Morton (111/57/117): Same as round 11. wanted the BPA SP available. Morton was pretty darn good last year; this could be a steal by 5 rounds if he repeats. Round 13/#127 overall: Aaron Hicks (110/39/115): Another guy who was great last year; why is he still sitting around in the 13th? He’s hurt sure, and i just missed out on Edwin Encarnacion here, but I like the Hicks gamble. Round 14/#134 overall: Jose LeClerc (138/51/121): Grabbed my 3rd solid closer; #51 producer last year. My team is starting to look like the all-2018 team; i’m hoping for a lot of reproduction of results. Round 15/#147 overall: Eloy Jiminez (121/na/118): So, while a lot of the rookie news is on Guerrero and Robles … Jiminez is going to be a monster. He had nearly a 1.000 OPS in half a season at AAA last year, with a ton of power. He’s going to sit a few weeks in AAA before coming up but should be a middle-of-the-order beast for a long time. I got good value both in Yahoo and ADP here too. Only thing is … now i’ve got TWO rookies who will be unavailable for a few weeks. My season is going to open rough. Round 16/#154 overall: Arodys Vizcaino (213/103/184): Braves closer, who was #103 producer last year for a 90+ win projected team; why is he still out there? It was an odd draft for closers; at the end of the night there were at least 6-7 closers available, and I got 5 of them. I may have been over thinking things and over valuing closers. Round 17/#167 overall: Yusei Kikuchi (172/na/167): Another unknown, another gamble. I like the scouting report. Going for BPA SP right now. Porcello and Eovaldi went bang bang ahead of me, tow guys I would have taken. Round 18/#174 overall: Alex Colome (214/278/212): My 5th closer; none of the SPs sitting out there looked useful. Best closer available; might be first player dropped. Round 19/#187 overall: Kevin Gausman (195/802/195): Just missed on Smoak and Ryu here; I like Gausman as a sleeper big time; when he escaped Baltimore his numbers were excellent: 142 ERA+ in 10 games. I’ll take that. Ignore his 2018 totals; his performance in the NL was great. To me this is a steal in round 19. Round 20/#194 overall: Forest Whitley (773/na/290): Ok, so this was a mistake. It was late, we had been drinking. I am well aware of Whitley’s capabilities, but its clear now that he’s not coming up for a while. I should have grabbed a different young Houston starter, and in fact will drop Whitley as my first waiver wire. But I’ll try to grab him when he comes back. Round 21/#207 overall: Luke Voit (199/784/177); So, amazingly, at round 21 I still didnt’ have a Catcher (which i’ve long since decided to do the waiver wire game on) or a 1B (or a 2B, depending on where I play Murphy). I probably waited too long, and had a couple of just misses on better 1B candidates. So I grabbed Voit here; he should be the Yankees 1B, and if not we’ll dump him for another guy. Love my infielders: Murphy, Bregman, Lindor, Guerrero, Voit. There’s some intriguing SPs who went undrafted; Anibel Sanchez in particular. I think he’s going to be sneaky good and already put in my first waiver wire claim for him (dropping Whitley). So, that’s my team. Lots of new names for me, so that’s going to be cool to follow guys I don’t normally. « Solis out; what does this mean for MLB bullpen? Subscribe to comments with RSS or TrackBack to 'Fantasy Baseball 2019 – My drafted Team'. Unrelated, but 12 years, $430M for Mike Trout extension with the Angels. Bryce’s “record” deal lasted how many days? So great! Clark, I’ve been laughing all afternoon. So much for that two-week “record”! The “record” that would have mattered, and that would have held up, would have been the $40-45M AAV from the Dodgers. Oh well, enjoy 13 LONG years in Philly! Todd, I’m very interested to see what Murph can do at a mile high. I don’t know whether he can make it all the way back, but if he does, he may hit 35 or so. Starters: Greinke and Morton could be really good if they don’t suddenly show their age. Kikuchi is an interesting gamble. Gausman is only a steal if he can stay healthy. Even better–the Trout contract happened right after Harper got done shooting off his mouth about how he was going to get Trout to come play with him in Philly. Harper’s egomania, which was clearly out-of-control last year, is going to reach epic proportions now that he’s no longer constrained by worrying about his contract. Funny he thinks he can get other players to join him in Philly and doesn’t seem to realize that no one likes a consistently underperfomring gloryhound who throws his teammates under the bus as he did to Wieters at the All Star Break last year. Sorry I can’t post the links but must reading on the Trout signing are Tom Verducci with SI and Thom Loverro with the W. Times. Loverro really puts Harper in his place. Verducci mentions that Trout’s WAR is almost equal to Harper and Machado combined. Thanks, Mark. The Loverro column was great. The fact that he claims he asked for the contract not to have an opt-out clause is hysterical, but the fact that he could have had one for only $20M less is even better. Man, I am so glad I don’t have to root for Harper anymore. Remember the old interview where he named his favorite sports teams as a kid? NFL? Cowboys. MLB? Yankees. NBA? Lakers. NCAAB? Duke. There are few indictments of a person’s character worse than being a front-runner. And now he’s bad-mouthing DC fans? Good riddance to bad rubbish. Bryce fans will say this is just bitterness because he left, but it’s not. I’m genuinely ecstatic that I don’t have to pull for this jackass anymore. Harper went 11th; first player 2nd round. I would have taken him, Soto (12th) or Yelich (13th) if they were available to me at pick #14 but boom, boom boom all gone. I think Harper expodes this year at CBP for 50 homers. In separate news. Gio Gonzalez 1yr/$3M MLFA deal to be the Yankees 6th starter. It was (according to him) the ONLY offer he got this off-season. I’d conservatively estimate that 20 teams in the league could have easily improved on their #5 starter with Gio versus who is slotted there. And you can make a very easy case that, even taking all the tankers out of the equation, that several teams really had no excuse for not pursuing Gio at that price tag. Milwaukee, the Angels, Pittsburgh and Oakland, Colorado and Tampa all could use better starting pitching. Harper: I think he may eventually have 50 in him in that ridiculous bandbox, but he’s so wound up this year in still trying to prove/justify himself that he’s probably going to keep screwing himself into the ground more often than not. Remember, he’s only topped 30 HRs twice. The Gio-non-signing should be Exhibit A in a collusion case, or at least as proof to America that only a few teams are trying. You’re right, at least 20 teams could use him. Along similar lines, I was thinking in reference to the Trout signing how bad the Angel pitching is every year. Bully for Trout for getting the “real” record contract, but good luck to him being tied to a team that has been perpetually bad at building a complete roster, particularly on the mound. While I agree that Gio’s situation seemed unwarranted, with the contracts that have been handed out this offseason, collusion is going to be a very hard case to make. the bigger issue is one of disparity between the elite players and everyone else. I think raising the minimum salaries (say $1m/$1.5m/$2m) might be the single biggest thing to help all players, including the older vets because the young guys don’t look so comparatively cheap any more. LAA is a good platform to succeed for trout. Lots of money, an attractive market to FAs and a division that hasn’t historically been too strong. They haven’t done great lately, but I think Eppler is doing a good job rebuilding the farm while the ugly contracts work themselves off. There are many worse places to commit long term to. Bryce is going to do fine. I don’t share the need to bash him, but I get that others do. I wish he was in a different division, but whatever. 1 week away. Seems like a long time coming….. I cheered for Harper while he was here, although I’ll admit that much of the 2018 drama was hard to take. Since the end of the season, though, and particularly since he signed with the despised Phillies, he’s stuck his cleat in his mouth at every opportunity. He’s basically come across as the spoiled, ungracious punk folks outside of DC have always accused him of being. Nat fans stuck up for him for seven years and cheered him through thick and thin. Teammates (except one) defended him. By many accounts, the Lerners treated him like a son. He should be nothing but grateful for his DC experience. The Nats didn’t “disrespect” him with the contract offer. It was EXACTLY what he and Boras should have expected for a first offer from a team that does a lot of deferred contracts. You then negotiate from the basis of the first offer. But he didn’t. He’ll never know what the Nats’ best offer would have been because he was too immature to negotiate. Considering the ridiculously low AAV he ended up getting from the Phils, I would bet the Nats would have given him that deal in Sept.-Oct. if he would have negotiated. But HE didn’t. It wasn’t the Nats; it was him. All in all, though, it’s probably best for the Nats to move on from the perpetual drama. The drama should be on the field, wondering whether our bullpen will how up, how good a rookie season Robles will have. The Nats seems fine with an amicable breakup. It’s the spoiled brat who is still acting like the jilted lover. And for that, he can rot in 13 LONG years of Philadelphia hell. Looking ahead, I’m excited about the 2019 season. The Nats certainly have made a lot of moves, and the team looks strong, although we’ll have to see whether it is truly a Kimbrel short of great. Bullpen: we’ve already discussed this area a good bit. They have made some upgrades, but a lot is riding on Rosenthal’s recovery and Doolittle’s ability to stay healthy. The late Sipp signing really helped in the LH department. Bench: should be pretty good once Kendrick and Taylor are healthy, but right now they’re not. They may open the season with Stevenson and Sanchez on the bench, neither of whom should be getting ABs for a contender. Too bad the vagaries of the time clock keep them from using C. Kieboom over Sanchez. Dozier: his slow spring is concerning for a guy looking to bounce back. He did homer last night, though. If Dozier craters, at least they’ve got Kendrick and the eventual C. Kieboom option. Schedule: the Nats open with 11 games with the Mets/Phils/Mets/Phils. If they’re not ready to go out of the gate, they could dig a hole right away. On the flip side, if they dominate, they could put those other guys in holes. Pluses: Robles has had a great spring and looks ready to contribute. The Taylor injury will let him get the season started without the silly “sharing time” thing hanging over his head. Gomes has hit .448 for the spring with four homers, so he seems to like his new surroundings. Suzuki is hitting a measly .346. Major, major upgrades at catcher. The rotation also has been upgraded, and Stras looks healthy and is dealing. Betts may get a higher AAV than Trout. And Soto may end getting more than all of them . . .
Kidding aside, I’m curious to see what Soto can do for an encore. It doesn’t look like he’s been resting on his laurels. We’ll see. Assuming Miller is healthy (he’s been getting game action) and Sipp is ready (which he says he will be), there’s only one ‘pen slot open and a lot of candidates: Ross, Williams, Suero, Nuno, and Copeland, this year’s out-of-nowhere vet. Austen Williams has been phenomenal, giving up only two hits and no walks or runs all spring. As I’ve noted on Nats Prospects, this is a guy we weren’t even sure would be invited back for the 2018 season. Amazing story. Ross and Williams both give them multi-inning capability, which could be important with Helly (0.95 spring ERA) and Sanchez in the rotation. The Braves also have big starting pitching concerns. Folty and Gausman both have only thrown 2.0 IP apiece. Newcomb has a 5.29 ERA. Sanchez now pitches for another team. Acuna has been hammering it, but Donaldson has really struggled thus far (.167 BA, 1 HR). The Mets have gotten strong springs from their top three starters, but Matz has gotten crushed (including by the Nats), and we know Vargas isn’t good. Cano and Ramos have been hitting well, and Conforto has 5 HRs, but the rest of their lineup may not be great. And the Nats? All of their starting pitchers are healthy. Only Corbin appears to be struggling somewhat. Doolittle has had some spring issues as well. My perception was that Rosey had struggled, but he’s got a 2.35 ERA, so he must have worked through some things. With the lineup, there are low BAs for Dozier (but 3 HRs), Zim, and Trea. The OF trio is rockin’ it, though, as is the catching duo. All in all, the Nats appear to be in the best shape among NL East folks to get off to a strong start. Now they’ve just got to do it. Dougherty, the new Post beat writer, projects Suero to get the last bullpen slot. He also makes it sound like Kendrick and Taylor may make it back by Opening Day, or at least soon thereafter. Kendrick seems farther along than Taylor. Ross, Nuno, and Copeland sent to the minors, so last spot between Suero and Williams. Williams can’t possibly have been better than he was. Hello to my old friends here. Have been down at spring training this past week, helping my little man hunt autographs. Thought I would give you a heads up on whom the coaches and players have been impressed with, of people that the pundits are not yet talking about. Outfield: Eric Senior has made significant strides relative to the other outfield group this spring, so if you’ve been waiting around for him, may be that the waiting is over. DeLa Rosa getting love as well. Grant Borne is throwing. Seth Romero with teammates and looks a lot slimmer. Our old friend Rafael Bautista is back, as was Mario Sanchez (traded for Cordero). Just some intel from the scene. Fore — great intel! As the one (and perhaps only) person fanning the flames for Eric Senior for the last couple of years, based on his super JUCO stats, I’m glad to hear that he’s showing some life. Oh, from the same draft as Senior, I saw a minor-league list this spring that didn’t include Justin Connell. I’m curious whether you saw him and if he’s still with the club. I heard Mark Scialabba on with Charlie and Dave, and he was really talking up Adon. Rhinesmith got a fair amount of run as a sub in MLB games this spring, which was surprising since he hasn’t played above Auburn. I thought more of that would go to Canning, who was drafted higher and promoted higher. Rhinesmith, Wilson, and O’Connor (sounds like a law firm) would seem to have more power potential than Canning does, though. They really need some OFs to make a leap into the upper minors, as most of their AAA and AA OF slots are filled by guys who have been dumped by other organizations. It would be great if Barrera develops as a hitter. The rest of the catcher landscape is pretty barren until you get down to Pineda. This may be the last season they can option Spencer Kieboom, so there will be the threat of losing him next season like they just lost Severino. Marlins release Dan Straily. Don’t know whether he’d take a minor-league contract to go to Fresno, but I’d sure inquire. Very curious that the Nats are sending Fedde to Harrisburg, ostensibly as the nearby emergency starter. Could it be that he’s also sucked so badly that they hope he can rebuild some confidence against AA hitters? Goodness, somebody would have to be smoking something with Seth Romero to think that Fedde is a better option right now than Ross is. Fore – any discussion of the two Brewers picked up for Gio – lara and Harrison? They each had name recognition earlier in their career, but are tarnished now. They like Lara from what they have seen. Harrison is going to A-, along with OConnor, C Wilson, JSanchez, Ryan Williamson, Rhinesmith, marinconz,. I just saw Senior deposit a couple of BP home runs. Blake Chisholm too. Deal Rosa has a sweet looking swing. Whacks line drive after line drive. Looks like Franco, O Abreu, Reetz, Upshaw, Agustin, Freeman, Corredor, Esthay, there too. Agustin hit an opposite field HR leading off intrasquad vs. Astros. He knows what he is doing. Is Harrison catching or at 1B? Big difference in his value if he can stick at C.
Also don’t want to get my question buried — Fore, is Justin Connell in the minor-league camp? That’s a pretty underwhelming lineup for (the last year at) Potomac, unless Franco suddenly regains “prospect” form. There’s not going to be much standing in the way of the crop at Hagerstown moving up quickly. This will be the age-20 season for Adon, although he turns 21 in August. He hasn’t pitched above Auburn where he got whacked. According to Scialabba, he has filled out a good bit, and his heater sits around 95 or so. He’s the latest in the line of hard-throwing Latin signees, few of whom have actually “made it,” although they did get good trade returns for Lopez and J-Rod. On another note, it’s sad to see the announcement of the “retirement” of Carson Shaddy, the Bill Buckner of last year’s College World Series. Have to wonder whether he ever got over that drop. Plus he didn’t hit much at Auburn. Also, that’s a “wow” to have Irvin fast-tracked to Potomac. He barely appeared at Auburn last summer and is skipping Hags. He could be this season’s Crowe. It will be interesting to see how the 2017 and 2018 arms draftees get sprinkled across the system. There were a lot of struggles among the 2017 group, so some of those guys may get passed pretty quickly. Connell is at Hagerstown, very much in camp. Caulfield is another guy I saw at Potomac. I also heard very good things about Canning from one of the pitchers, so watch him as well. Another pitcher talked up Reid Schaller to me. My intel on placements is conditional – I watched the “Potomac” team play and the “Hagerstown” team play. Teams do lend each other players, etc., but Tripp Keister told me to look on the respective fields because the folks I would see would be consistent with the assignments. I congratulated Irvin on his promotion. He thanked me and in a knowing way, so I think that’s accurate. As for Senior, he is a very likeable person, pleasant. His manner and even his build is very Michael Taylor but he is very tall and lean. Harrison is not going to be catching. There are many talented defensive catchers in the system and they want to see what’s in his bat. Among other notables, I spoke to Tyler Mapes, who is healthy and ready to rock and roll. Back to the unreliable pundits comment. The best lower minor pitching prospect in the organization right now, including last year’s draft, is Adon, whom I heard “could go quickly” from a name you all know and trust. The best hitting prospect in the lower minors is Rhinesmith, whom everybody named. As for upper minors, people still talk up Crowe. Seth Romero was there. He was quiet and there with his teammates, doing his rehab, serious, looking as he should. Weston Davis is rehabbing still. Grant Borne was pitching. I saw Istler, too, so he’s still around. Gabe Klobotsis said he was healthy but you can’t tell. He’s so low key that he redefines low key. Interesting about Shaddy. His Arkansas teammate was drafted by the Nats, and in a 60 second conversation brought that drop up to me. So Shaddy isn’t the only one thinking about it. Also, Alex Troop looks healthy and ready. I’m sure I am forgetting people, but we were there a few days and there’s lots of stories that come up. My off-the-radar minor-league picks to click last season were Senior and Troop. Maybe I was just a year too early! It’s going to be an interesting sorting-out year for the farm system. A number of the old standbys have moved up, moved out, or been passed by. There’s not as much of an established pecking order, so the conga line may move faster for guys who are succeeding. It’s good to hear that several folks are still talking up Crowe. There was some talk/concern last year that he had sort of hit his ceiling, despite his rapid rise through the system (and just two years removed from TJ). Tejera worked wonders at Harrisburg last year with guys like McGowin and Williams. Let’s see if he can do the same with Crowe and Sharp this season. I would like to see Canning make AA and the AFL. The Nats need someone to move up quickly to be a better option than Stevenson. Taylor is a FA after ’19, so there will be some OF decisions to make soon. Predictions: Don’t know if Todd will have time to get a predictions post up; if so, I’ll move this over. Just browsing some stuff at lunch. I’ll start with an obscure fact that I stumbled upon: no team has won three straight NL pennants since the roster-depleted times of World War II (Cards, ’42-’44). Aside from the Dodgers, to me, the other higher-quality team in the NL is . . . the Nats. I think this is the best all-around team the Nats have fielded, although I don’t think they’ll be nipping at 100 wins like some other Nat squads because the division is better and because their manager has yet to prove that he can be a positive difference-maker in the close ones. I have no idea what to think about the rest of the NL. Baseball Prospectus has the Cubs last in the Central, with only 79 wins. The Dodgers probably will win the West, although it took them time to get going last year, and their pitching health is precarious. The Braves’ pitching health has moved beyond precarious with Folty and Gausman out for some time. Still can’t believe that they and the Phils didn’t spend on starting pitching. I’m going to say that those decisions keep them out of the wild card, albeit just barely. I’ll take the Brewers in the central and the Cards and Cubs getting wild cards in a mad scramble with the Phils, Braves, Mets (maybe), and Rockies. I was thinking the Reds might have a chance to be interesting this year, but they’ve been one of the losing-est teams in the spring. AL: Boston’s lineup may be better, but its pitching will be worse. The Yanks have stockpiled starting pitching, and I think that will nudge them past the Sox in the East. CLE and HOU seem like the other chalk divisional picks, although no one seems to be commenting on HOU losing two starters the quality of Keuchel and Morton. Most think that there’s only one AL wild card slot available beyond the “loser” between BOS and NYY. Contenders would appear to be TB, MIN, OAK, and LAA. OAK was terrific last year with a questionable rotation that is now further depleted, yet the A’s remained one of the best teams in the spring. My pick is the Rays, who people forget won 90 in a division with two 100+ win teams. Morton is a big addition for them. Fore – that’s good intel, thanks for sharing. Did you see Denaburg at all, and was there any talk about him? I am pretty bullish on him. What was Weston Davis rehabbing, TJ? KW – I don’t think MAT is a FA after this year; I think he is right around 4 years of service time. Your point about more outfield depth is still correct, though. I’d be surprised if Canning makes that move, however. I like the lineup for the Nats this year. It would be awesome if a healthy Murphy was playing 1B, but Zim + Adams is quality too. Worried about the pitching, including the SPs, but overall think they will do fine if they stay healthy. haven’t thought about the rest of the teams much, but think STL will be good this year, and like HOU the best in the AL. Thanks Forensicane for all the comments! That’s great stuff. One day I’ll get to spring training. FYI I saw Denaburg but don’t know what their plan is. You learn so much by watching and listening and it’s fun to share. Strongly recommend to all.